Nourishes your cat or kitten by supporting overall health and physical well-being. 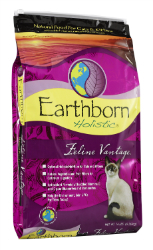 A natural holistic approach to feline nutrition with high quality ingredients to nourish the whole cat. We love cats and have developed a wholesome food to maintain your cat's overall health and total physical well-being, supporting all body functions. We select nature's finest digestible proteins, vegetables and fruits along with an exact blend of vitamins and minerals to support immunity and wellness. Every ingredient has a purpose nutritionally and is optimally balanced to provide the exact nutrition your cat needs-naturally. Feline Vantage™ contains Omega-6 and Omega-3 fatty acids which are vital for the immune and nervous systems while supporting healthy skin and coat. Quality animal and fish proteins such as chicken meal, herring meal, salmon meal and whitefish meal help build and maintain muscle. Balanced levels of calcium and phosphorus help build strong bones and teeth. Guaranteed levels of antioxidant nutrients like Vitamin E and Vitamin C blended with nutrient-rich vegetables and fruits such as peas, apples, blueberries, carrots, spinach and cranberries help support the immune system, good digestion and intestinal health. Fully cooked wholesome grains like brown rice, oats, barley and flaxseed are easily digested. 3,770 (M.E. Calculated, as fed) Kilo-Calories per kg/415 (M.E. Calculated, as fed) Kilo-Calories per cup. Chicken Meal, Ground Brown Rice, Pea Protein, Oat Meal, Dried Egg Product, Pea Fiber, Chicken Fat (preserved with mixed tocopherols), Herring Meal, Ground Barley, Ground Flaxseed, Tomato Pomace, Natural Flavor, Salmon Meal, Whitefish Meal, Blueberry Fiber, Cranberry Fiber, Choline Chloride, Apples, Blueberries, Carrots, Spinach, Cranberries, Canola Oil (preserved with mixed tocopherols, a source of Vitamin E), Taurine, L-Lysine, DL-Methionine, Potassium Chloride, Dicalcium Phosphate, Calcium Sulfate, Vitamin A Supplement, Vitamin D3 Supplement, Vitamin E Supplement, Zinc Sulfate, Ferrous Sulfate, Niacin, Folic Acid, Biotin, Manganese Sulfate, Copper Sulfate, Calcium Pantothenate, Thiamine Mononitrate, Pyridoxine Hydrochloride, Riboflavin Supplement, L-Ascorbyl-2-Polyphosphate (source of Vitamin C), Zinc Proteinate, Manganese Proteinate, Copper Proteinate, Calcium Iodate, Sodium Selenite, Cobalt Carbonate, Vitamin B12 Supplement, Yucca Schidgera Extract, Rosemary Extract, Dried Lactobacillus Plantarum Fermentation Product, Dried Enterococus Faecium Fermentation Product, Dried Lactobacillus Casei Fermentation Product, Dried Lactobacillus Acidophilus Fermentation Product.